The Office of Student Research is launching an initiative to support interdisciplinary research teams over the summer of 2013 to serve as models for interdisciplinary undergraduate research and creative activities, and to foster a sense of community amongst Truman faculty, staff and students. Two mentors, each from different departments, will collaborate on a research project during an eight-week equivalent period of time over the summer that involves and trains two undergraduates. Project proposals written by the faculty pair may be new or ongoing. One mentor in the team should be a tenure-track or tenured Truman faculty member. The other mentor may be a Truman faculty or staff member of any rank or appointment. Students will be chosen by the mentors but must be current, full-time (during 2012-2013) Truman undergraduate students in good academic standing and plan to graduate no earlier than December 2013. Projects will be funded up to the maximum value of $8,500 per team and should be carried out between May 20 and Aug. 15. For complete details on Interdisciplinary Research Community Grants, visit osr.truman.edu. The deadline for applications, which are to be written by the two mentors, will be Feb. 15. The Truman Public Relations Office has selected Kaitlyn Hall, a senior public communications major and English minor, as intern for the Spring 2013 semester. Hall is from Rolla, Mo., and a 2009 graduate of Rolla High School. She is the daughter of Richard and Amy Hall. As intern for the Public Relations Office, Hall will help write, layout and distribute the University newsletter, Truman Today, on campus and online. She will also assist in planning University events, write press releases and fulfill various office tasks. Hall serves as the current president of Cardinal Key National Honor Society where she is active in community service projects. 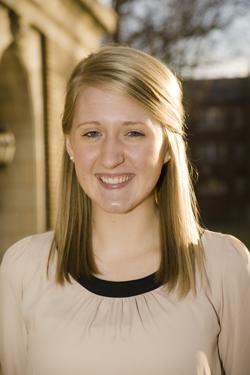 She is also a part of the CARE for AIDS promotions committee and a member of Campus Christian Fellowship. She was previously involved with Residence Life as a student advisor. Hall hopes to pursue a career in non-profit public relations and is excited for the experience she will gain during her internship this semester. The ITS staff used the winter break for various upgrade projects across campus. Most of the projects were focused on classroom and public lab improvements. Seven classrooms were upgraded with new projectors and AV control systems, with plans to complete the remaining 60 projector/controller upgrades during the spring and summer breaks. The operating systems used by more than 600 public lab and classroom systems were updated as well, and preventative maintenance was completed in all classrooms. Several campus-wide applications were also upgraded to achieve greater efficiencies, including the disk infrastructure used on many applications systems and the classroom/space management system. Blackboard was also updated to include the creation of new user documentation. New financial aid and enrollment management system modules were installed for testing. ITS partnered with Physical Plant on the installation of 30 white boards in Violette Hall. The workstation and network teams also assisted with various office moves, helping to complete the moves of the University Press and 16th Century Journal. • What should I read for pleasure? Proposed sessions can fit into a 25-minute, a 55-minute or an 85-minute time slot. Sessions lasting 85 minutes must include an active learning component. Limited funds are available for photocopying and other necessary supplies. To submit a proposed session, complete the session description sheet online at provost.truman.edu/University_Conference/index.asp and turn it in to the Provost’s Office, McClain 203, by 4:30 p.m. Jan. 28. Proposals will be selected by Feb. 6. If you do not want to propose a session but have an idea for a session that you would like to attend, email Marty Eisenberg at martye@truman.edu. Graduating seniors have the opportunity to recognize a high school educator/counselor whom they feel made a positive impact on their academic growth. The selected teacher/counselor will be invited to be formally recognized and participate in spring commencement and a $1,000 scholarship in their honor will be awarded to an incoming Truman student from their high school. Those graduating seniors that would like to make a nomination can do so at giving.truman.edu/teacherrecognition. The nomination deadline is Feb. 8. Organizations will be available to distribute their information to perspective members and inspire campus involvement of individuals within these organizations in order to provide a well-rounded Truman experience. Alpha Phi Omega will be hosting a Red Cross blood drive from 10:30 a.m.-5:30 p.m. Feb. 6-7 in the Student Union Building Georgian Room. Donors are encouraged to sign up at tables in the Student Union Building or McClain, Missouri, Ryle and Magruder halls starting Jan. 29 or to sign up at redcrossblood.org. Walk-ins are always welcome. Students interested in joining Truman’s national co-ed service fraternity this spring are encouraged to attend an APO rush information meeting. APO will be hosting events at 6 p.m. and 6:45 p.m. Jan. 22, 23 and 24 in Violette Hall 1148. Sign-up for TRU Fit 2013 is under way. TRU Fit is an activity-based incentive program to help participants track how much activity they get in a week. All Truman students, staff and faculty can sign up for free at recreation.truman.edu/trufit/signup.asp. The first 12 weeks will take place from Jan. 28-April 21. Participants are encouraged to set goals and at a minimum track three days of 30 minutes of activity. Those who complete 10 of the first 12 weeks are eligible to receive a TRU Fit T-shirt. Participate in intramurals, go for a walk, take a class at the REC—all of those things can be tracked to meet TRU Fit goals. Sponsored by the Student Recreation Center Fitness/Wellness Department and The President’s Committee for Campus Wellbeing. Check out the Master Calendar for Spring Rush information for campus organizations, including: Alpha Phi Omega, Phi Beta Lambda, Tau Lambda Sigma, Prim Roses, Sigma Chi Delta, Cardinal Key, the Interfraternity Council and more. Truman volleyball coach Ben Briney and his staff and players will be hosting a series of winter clinics this February and March in Pershing Arena. For just $60 for six sessions (or $15 per session), volleyball players ages 5th-grade and older can receive 1-on-1 and group instruction on all fundamental skills with a high amount of individual feedback. Each event runs from 1-3 p.m. and will take place: Feb. 2, 9, 16, 23; and March 3, 9. For more information, contact assistant coach Megan Wargo-Kearney at 660.785.7751 or mwargo@truman.edu. Both pre-registration or walk-up will be accepted. The Northeast Missouri Alumni Chapter of the Truman State University Alumni Association invites all campus and community friends to join our chapter. Membership entitles the holder to free admission to regular season home athletic events, free social events throughout the year, hotel and rental car discounts, checkout privileges at Pickler Memorial Library, a complimentary subscription to the Truman Review and more. You do not have to be a Truman graduate to be a chapter member. Individual, family and gift memberships are available at a range of price points. Purchase a 2013 membership today through the online Alumni Store at alumni.truman.edu/membership. Tax season is here again! The Tax Forms page has links to federal and state tax forms, as well as links to tax guides and assistance centers. Visit library.truman.edu/weblinks/taxes.asp or follow the link from the Library’s home page. techniques to both your classes and your clients. Some of the topics include energy systems, EPOC and appropriate application of methodology. The National Exercise Trainers Association (NETA), a non-profit fitness professional association, and the Campus Recreation Center will co-sponsor the workshops. The WGST Conference is sponsored by the Office of Interdisciplinary Studies. The website College Humor is offering two $5,000 scholarships. Compete details are available at collegehumor.com/average-student-scholarship-contest. Deadline to apply is Feb. 1. The CEO of Tomorrow Scholarship is a $2,500 scholarship for students interested in business leadership and/or entrepreneurship. Applicants must answer a short online survey and submit a 500-1,000 word essay on “the CEO of tomorrow.” Possible topics could include (but are not limited to) company structure, company culture or utilization of technology. For more information, or to apply, go to www.ceo.com. Deadline is July 1. As computer equipment becomes older, eventually it no longer provides acceptable services. When old computer systems are replaced, ITS evaluates the used computer systems. If the used computers can perform other Truman services in a productive manner, then ITS may reallocate them in a different role. Truman new computer purchases usually take place during the summer. Late summer and fall are normally when ITS is processing and evaluating used computer equipment. Most used computers have reached their final end-of-life and are not suitable for reallocation but a few computers are still useful. If you have a computer need that you believe could possibly be met with an older computer system, contact the ITS Help Desk and submit your request. ITS will evaluate each request and work to find a suitable used computer system available that may be able to be reallocated it to meet your computer need. Keep in mind the number and capability of suitable used computer systems is quite limited. Also, these computers are several years old and out of warranty coverage. While they may still be useful in some secondary usage situations they should not be used for any Truman mission critical processes. For more information, contact the ITS Help Desk at 660.785.4544. ITS provides several locations where faculty, staff and student computer files are automatically backed up. Users are encouraged to take advantage of these locations to help protect data against any loss. Files stored on the Y: drive, the personal network storage area, or on the W: drive, the network storage area shared within departments, are automatically backed up by ITS. Email on the Exchange server is automatically backed up. Note: it is possible to configure your email client to download your email from Exchange so it ONLY resides on your PC. This is an advanced email client configuration ITS does not recommend. If you do this your email is not backed up on Exchange. Email archives you create are not automatically backed up unless you store them on your Y: or W: drive. Academic course materials faculty store in the Blackboard system are automatically backed up. Faculty materials stored in the Truman Google Apps for Education system are also automatically backed up. Note: staff materials stored in the Google Apps for Education system are not automatically backed up. If you have important files on your personal computer hard drive, they are not automatically backed up. Be sure to regularly copy your personal computer documents to your network Y: drive, an external hard drive or some other secure storage location to ensure your files are backed up and protected. For questions about what locations are automatically backed up, contact the ITS Help Desk at 660.785.4544. Tom Capuano, professor of foreign language, wrote the prologue to Maria Antònia Martí Escayol’s book “De Re Rustica,” which was recently published by Edicions i Propostes Culturals Andana in Vilafranca del Penedès, Catalunya, Spain. Martí Escayol is professor of history in the Departament d’Història Moderna i Contemporània of the Universitat Autònoma de Barcelona. Both she and Capuano research medieval agriculture in Spain. Antonio Scuderi, professor of Italian, published an article on the Italian Nobel playwright Luigi Pirandello (1867-1936), in Modern Language Review in Great Britain. Roe at 40, a panel discussion sponsored by the Women’s and Gender Studies Committee, will take place at 7:30 p.m. Jan. 22 in Baldwin Hall 231. Panelists include Bertha Thomas, Amanda Shetler, Jerry Hirsch, Paul Parker, Melissa Holcomb and Julia Judlin. Each panelist will speak for a few minutes and then the floor will be open to questions and comments. The School of Business Student Organization Fair will take place from 12-2 p.m. Jan. 23 in the Violette Hall Upper Commons. Representatives from various Truman business organizations will be available to speak with potential new members. A public reception for faculty exhibitions in the Art Gallery will take place at 6 p.m. Jan. 24 in Ophelia Parrish. Works by Aaron Fine, professor of art, Priya Kambli, professor of art, and Jamie Bates, lecturer in art, will be on display in the main gallery. Phi Mu Alpha will present “A Pops Musicale” at 2 p.m. Jan. 27 in the Ophelia Parrish Performance Hall. Jillian Anthony, campus recruiter for The Washington Center for Internships and Academic Seminars, will be on campus for an information meeting to discuss internship opportunities in the D.C. area at 4 p.m. Jan. 29 in the Student Union Building Georgian Room A. Past interns will be in attendance to share their own experiences and answer questions as well. For more information, visit the Truman in Washington Program website at twp.truman.edu. For questions regarding the Truman in Washington Program, contact Jay Self at selfjw@truman.edu. Residence Life will host an On-Campus Apartment Open House Jan. 30. A sample of all three apartment buildings on campus will be available for viewing. For more information, contact the Residence Life Office at 660.785.4227. The Activities Fair will begin at 1 p.m. Jan. 30 in the Student Union Building. Organizations will be available to distribute their information to perspective members and inspire campus involvement of individuals within these organizations in order to provide a well-rounded Truman experience. A Missouri London Summer 2013 informational meeting will take place at 6 p.m. Jan. 30 in Ophelia Parrish Room 2115. Learn about the Rock Generation study abroad course in London and Liverpool. For more information, contact Gregory Jones at grjones@truman.edu. The Women’s and Gender Studies Conference will take place from 9 a.m.-6 p.m. Jan. 31-Feb. 2 in the Student Union Building Activities Room. For more information, visit wgstconference.truman.edu. The University Orchestra will perform at 8 p.m. Feb. 2 in the Ophelia Parrish Performance Hall.